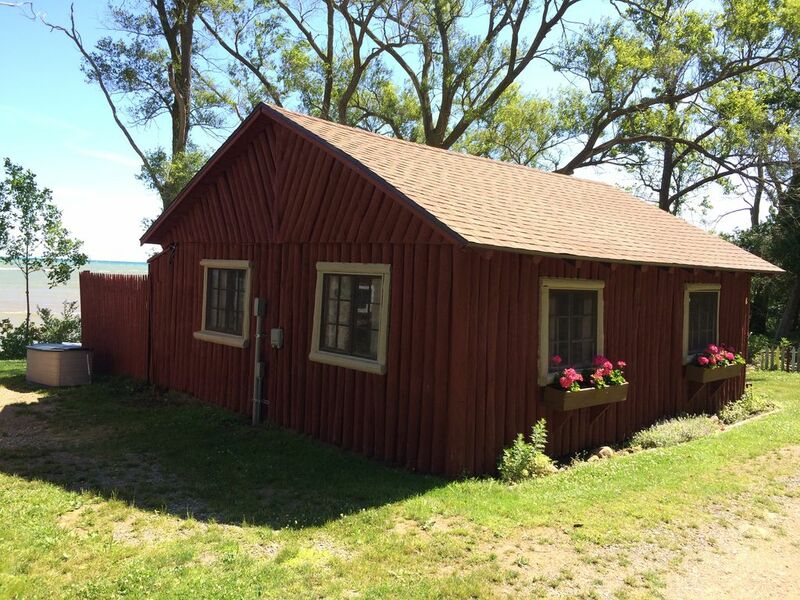 Stay on Lake Huron in this 2 bedroom, 1 bathroom cottage with a kitchen area and a dining table overlooking the lake. Separate fire pit overlooking the lake. Sleeps 4 adults maximum. Enjoy the view of passing ships, wildlife and the adjacent Lighthouse Park beach area. Explore the Lighthouse next door. Bring your canoe or kayak and explore the Huron county Kayak trail. Small boats can be launched next door at Lighthouse Park. BBQ grill and picnic tables are provided. Cooking utensils and kitchen equipment are furnished. This cedar cabin is one of seven located on over 300 feet of shoreline. The cabin was built in 1947 and has city water and electric service. The cabin comes furnished. Close to Port Austin and Grindstone and adjacent to Lighthouse Park. We offer weekly rentals along with short term rentals that have start and end days of Fridays, Sundays and Tuesdays. Stays of less than a week must have check in /check out dates of Friday, Sunday or Tuesday. For example, guests can check in on Friday and check out on Sunday (2 nights) or they could check in on Friday and check out on Tuesday (4 nights). Had a very relaxing time. This cabin was perfect! Small and quiet, good amenities including fast/reliable internet which helped being on a business trip. Listening to the sound of the waves crashing every night to sleep was very soothing and peaceful! Our family had a fantastic time at Cabin 8! Perfect size perfect setting, and Bryan and Lori were so sweet and friendly! We'll recommend them for sure! Brian and Laura have thought of everything at this property. I was really just expecting 4 walls, 2 beds and some kitchen plates, but it is fully stocked. The beds are made up with pillows and blankets, and the kitchen is filled with every gadget and tool you could possibly need. They even have things like foil, salt, and coffee grounds. The only things we had to bring were towels and food! Outside, there are lawn chairs and cushions, a picnic table and a fullsize grill. Each cabin has a fire pit, and they offer wood for sale if you didn't bring any with you. All of this on top of the excellent view! The cabins are right on the water and the windows in the kitchen face right out. The beach is rocky, but not unmanageable. You'll want to bring water shoes if you plan on swimming. We loved how quiet Port Hope was, while also being close to the action of Caseville & Port Austin. Grindstone City had some excellent ice cream cones right up the street, too. All in all, a wonderful stay! We thoroughly enjoyed our stay at Lightkeepers Vintage Cabin 8. The quaint cabin was full of character, exceptionally clean and contained all of the amenities we needed. The owners were very friendly -- willing to talk, but also allowing us our privacy. This cabin is on the end of a row of cabins. It had a beautiful flower garden, and fantastic views of Lake Huron. Would highly recommend this cabin and would love to return again.